Foundation Vice Chair Stacey Dickenson Cox, Southern Methodist, has always been grateful that Tri Delta pushed her out of her comfort zones, from her collegiate days to her time as a loyal volunteer. However, she likely did not realize that her comfort would also be tested again during her daughter Caroline’s recruitment experience and her own sorority membership. Attending SMU, Stacey participated in recruitment with no preconceived notions. She was not a legacy to any chapter and found her home in Tri Delta through strong connections with upperclassmen in Theta Kappa Chapter. Through her involvement in the chapter and love for organization, she served as reference chair and collegiate chapter president – a position which came as a surprise to her. “I’m so indebted to Tri Delta not just for those four years, but for all the leadership it’s afforded me as an adult,” Stacey said. As Stacey’s eldest daughter Caroline looked forward to her own collegiate experience at the University of Southern California, Stacey was sure to prepare Caroline for recruitment. Stacey also made sure to manage her own expectations for Caroline in recruitment. Perhaps Caroline wouldn’t connect with the Tri Delta chapter. As being a legacy doesn’t guarantee membership, Stacey mentally prepared herself for a scenario where Caroline was released from Tri Delta. USC has many strong Panhellenic chapters and Caroline could be a great fit in another chapter. At the end of the day, Stacey knew the importance of this being Caroline’s choice. Caroline had a great recruitment experience, ultimately attending preference parties for Tri Delta and Alpha Chi Omega. After attending her final preference party at Tri Delta, Caroline was having trouble making a decision. Stacey was confused as to what the problem was, as Caroline attended Tri Delta last – her decision should have been Tri Delta. Caroline then called Stacey and apologized. She had decided on Alpha Chi Omega. Following an initial heartbreak and “personal pity party,” Stacey began to make new realizations about sorority and how she would share this experience with Caroline. She was surprised that her compliant daughter had gained the independence to follow her own heart. As much as Stacey wanted to share Tri Delta with her, she didn’t want Caroline to make a lifetime commitment because of her mother. Now, as Caroline graduates, Stacey reflects back and is grateful for her experience in Alpha Chi Omega. She served as the chapter’s risk management chair and head of standards, gaining powerful leadership skills far beyond the classroom. The same experiences Stacey had as a Tri Delta member at SMU mirrored Caroline’s experiences in another sorority. And Stacey’s Tri Delta membership has been enriched by Alpha Chi Omega, gaining a greater appreciation for the sorority experience within Panhellenic. 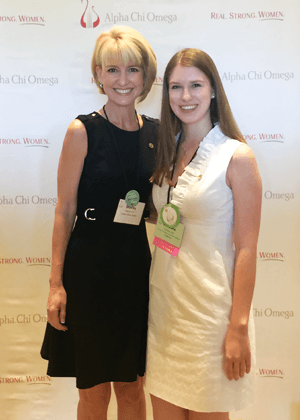 She’s not only been able to watch Caroline’s growth as an Alpha Chi, but she’s been invited to attend the Alpha Chi Omega Convention with her daughter and see the sorority experience through new eyes. Stacey also offers suggestions to Tri Delta moms who may have daughters approaching recruitment. “No mother speaks of recruitment and says, ‘that was a breeze!’” It’s important to stay connected and understand that the dynamics of recruitment have changed over the years. Interest in sorority life remains high and large numbers of women are still seeking the experience. Additionally, it’s imperative to be prepared for the difference in what Tri Deltas remember from their collegiate years and the current reality of their campus, chapter or experience. Any daughter finding a home in any sorority is still a celebration, and there is an opportunity to celebrate the sorority experience. Did you know? Tri Delta defines a legacy as a daughter, step-daughter, sister or step-sister of a Tri Delta member. Inviting a woman to membership in Tri Delta is the privilege and honor of the collegiate chapter members. Tri Delta gives its collegiate chapters full discretion on how they take legacy status into consideration, but they are required to define their membership selection process — including the placement of legacies on invitation lists and bid lists — in their collegiate chapter policies. Additionally, chapters may not release any information to anyone, including Tri Delta alumnae, regarding the status of a legacy or any potential new member throughout the recruitment process.